The Samsung UN55C7000 is a 55 inch 1080p Full HD 3D LED TV that offers a 1920 x 1080 screen resolution and has 4 HDMI Inputs. 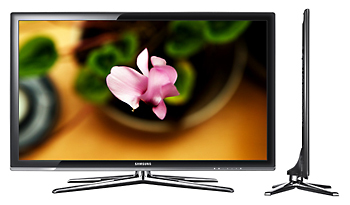 The samsung un55c7000 3d tv has an Ultra Slim Touch of Colour design, and Mega Dynamic Contrast for the most vibrant colours. In addition, there is also a feature called “BD Wise” which allows for optimized viewing of all multimedia formats. 62" x 35" x 8"
51" x 33" x 12"
51" x 30" x 1"